The Cordless Mouseman Wheel, the first of a series of cordless products from Logitech, was announced at PC Expo 99. Shown here, is the Cordless Wheel Mouse - a $49, 3 button cordless mouse that uses radio technology, via a receiver attached to mouse port, to connect to the computer. Since there are over 4,000 different transmission combinations, there should be no conflict between any two of these devices in the same work environment, but the Wheel mouse can change to a different frequency if a transmission conflict arises. 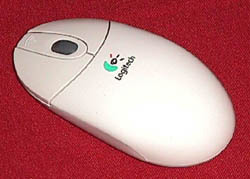 Unlike infrared mice, this device does not have to be constantly pointed towards the computer. This Logitech Cordless Wheel Mouse is a symmetric design, so it works for both left and right handed users. 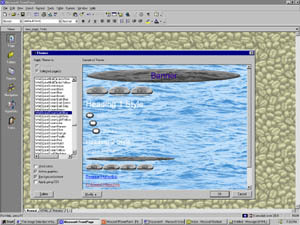 This software CDs contain 1,000,000 original and royalty-free Web art images, a Web page design guide and dozens of sample Web pages. Each customer then receives a free one-year subscription to the second million images, which are available online. Web Spice retails for $149 and will run on Windows 95, 98, NT, Macintosh and most UNIX computers. DeMorgan also bundles this product with their other products and it looks like the best deal is the WebSpice Deluxe, which includes four Web Spice products (WebSpice 2,000,000, Animations, Objects and Themes 2000). This package has an estimated street price of only $249. Copyright © 1999 Rick Smith All rights reserved.